I received a question from someone needing help on how to pass the exit hesi exam and what books to use to help them pass. I have just found your website and glad I did. My daughter is in her final days of nursing school, scheduled to graduate on May 9th to become a Registered Nurse. At the university she attends you have to pass the HESI with a 850. The class took a practice one at mid-term and she passed with a 859. So yesterday she took it and this time it counts. She scored 795. Needless to say she was very disappointed. They will retake it on May 1. This is the only other chance they get before graduation. She is a very hard working student. She is one of those that studies all the time. She has high B’s in all of her classes and was inducted into the nursing honor society last week. So I am writing you to ask what study methods or materials do you feel will be most helpful with this. She has the HESI review book, Saunders, and I don’t know what else. I know you don’t know her but she is a very good person who so very much deserves to pass. Please help if you will! First of all Janice, I would like to say I’m sorry that I didn’t answer your question in time. I see that she has already took the HESI and hopefully the end result is that she passed. You daughter graduates the same time I do….so congrats to her especially for getting through one of the toughest programs out there that is an accomplishment. Personally I think the HESI should never hold a nursing student back from receiving their diploma….that is just wrong. My advice on passing the HESI is to practice questions over and over. It is recommended that you practice 3000 questions before you take it. I think I answered around 4500-5000. I also read the HESI book from front to back. Here is the HESI book I bought and I passed first try….book is great. You can get it off Amazon.com. 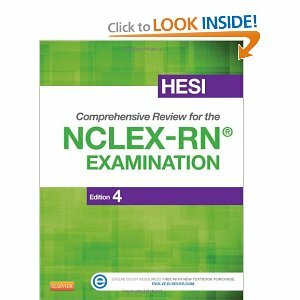 Plus check out my HESI & NCLEX study guide I used to study. I think the HESI book help out the most. I would suggest that she reads all of the end of the chapter questions. I wouldn’t use the HESI practice cd because it too hard and it really just hurts your self-esteem lol. I would scored like 50s-60s on it and I was like wow that HESI test is going to be hard and I probably won’t pass. I hope she passed and again sorry about the long delay. School and working have sucked all my time. Good luck to your daughter and I hope everything works out.